Our Reunion of John Bankes’ Descendants took place last Saturday, 18th June 21011, at Coulsdon United Football Club’s clubhouse in South London. After a downpour the previous day, which caused difficult travelling conditions for some of the attendees, the weather on the big day was much improved – showery with sunny intervals. The Reunion was attended by 43 descendants of the half siblings of John Bankes, Citizen & Haberdasher of London (c1650-1719), who came to Coulsdon from far and near. Their ages ranged from 12 to 96! Our ice breaker was a game of Bankes Bingo, organised by Helen (Culshaw) Mitchell. This provided some light hearted amusement, whilst enabling us all to learn a bit about the lives of some of our forebears. This was followed by a talk, given by Geoff Culshaw, the writer of this blog, on John Bankes. I outlined what we have learned about Bankes over the course of some 24 years of research, and how we have obtained the information. I also mentioned some of the things that we don’t know about Bankes. Basically, we know quite a lot about his business life, but lack information on the dates and whereabouts of his birth and first marriage. It would be lovely to think that we may solve this conundrum one day, but it does not seem likely at present! After a period of mingling, including a splendid buffet lunch, we reconvened for our second talk. This was delivered by Helen (Culshaw) Mitchell, and had as its subject the amazing Robert Hanham Collyer. A glance through the Robert Hanham Collyer Chronology on the Geoffs Genealogy website is sufficient to tell you that this was no ordinary Bankes descendant. By turns he was a medical doctor, a showman, a gold prospector, an inventor, and a host of other things as well. Helen related his life story in an informative but lighthearted style, and provided all of us with a most entertaining talk. There was then a little time left for further mingling before the attendees started to wend their way to their homes. All said that they had enjoyed the event very much. Many of them had learned something new about their family or the Bankes Pedigree, whilst others had met “new” relations or become re-acquainted with people they had not seen for many years.. 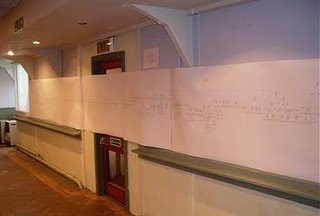 I must just mention the enormous family trees that adorned the walls of one of the rooms at our disposal. There were three trees, which Helen and I had specially produced for the occasion – one each for descendants of our eighteenth century ancestors Mary Rand, Anne Rand, and Joseph Rand. They took up three of the four walls of a very large room, and people were able to enjoy looking at their own section of interest. Attendees were encouraged to write on the trees, adding information that was missing, or correcting any errors that they could spot. Many people did this, I’m delighted to say, and it will be my task to assimilate this extra information into my records. Attendees were told that if would like a copy of their section of these trees they should contact either me or Helen. We will then provide them with specially formulated pdf file and the name of the printer who produced the tree for us, so that they can obtain a copy themselves. As soon as we can manage it we shall post the slides from the two talks on the internet. We will let everybody who came to the event know when we have done this. We also plan to make available the notes that were used for the Bankes Bingo game. One disappointment for me was that my photographs of the event did not come out at all well. I have therefore asked whether anybody has some photographs that they are happy to share with me. I have already received one positive reply to this plea, from Don Bates, and I thank him very much for that. If anybody else can help me I shall be very grateful to them. After all the months of planning, it seems strange to think that the Bankes Reunion is over. Now, on to the next task – preparing the September edition of the Shropshire Family History Society journal. That will occupy me through most of July.